I like this theme very much. 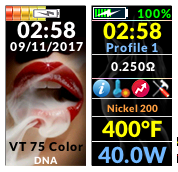 I am using it on HCigar Vt75D. I am little confused when using this in vw wattage only mode it is still showing a temperature setting on the display? 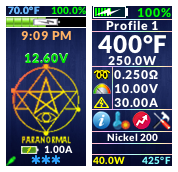 I would have thought that if you were in a non-temperature mode such as Kanthal or Nichrome it would not show any temperature setting in the display? Other than that issue the theme is wonderful and very easy to read.